Simple and reliable timers to use with your XF or XF style workouts. 4Time contains a standard timer, countdown timer, interval timer, lap timer, and even a fully programmable tabata timer. 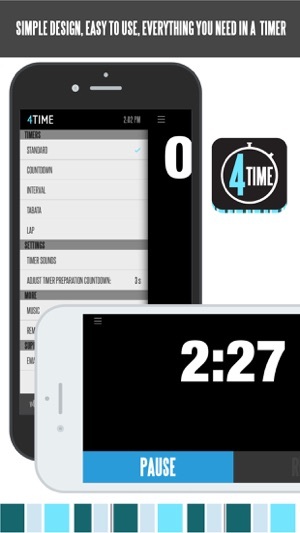 ◦ 4Time is the only timer in the App Store that allows you to use your second iOS device as a remote control! (in-app purchase required; both devices must be running same version of iOS). 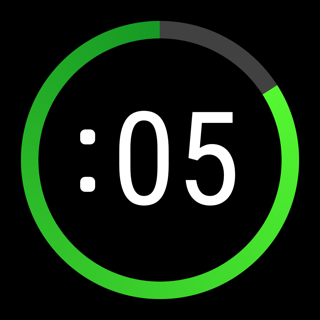 ◦ All timers allow you to tap the screen to add reps (except the lap timer, which allows you to add laps), helping you or a friend to keep count while you're working out. ◦ After you complete your workout, you're automatically shown your results (if available) displaying your completed reps for each round. This makes it easy to track your workout round by round and record this data to your personal log/journal easily. 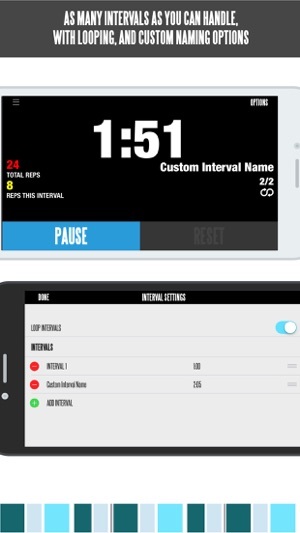 ◦ Tabata Timer: Allows you to set work, rest between intervals, rest between tabatas, number of rounds, and number of tabatas -- as well as a custom name for each tabata. Everything you need! ◦ 4Time also give you access to your device's music library so you can listen to that power song to push you the extra mile! ◦ Like to be original? 4Time offers several different timer sounds for you to choose one (requires in app purchase). This is my first app review in all my years of having apps (since the 2nd ever iPhone was released). I felt compelled to give a positive review for this after trying about 8 other HIIT/interval timers for my new garage bootcamp-esque gym. The other apps came close to meeting all my needs, but not entirely. This one tho has met them all! Love the various stop watch options and especially love that I can name specific tabatas by the exercises. 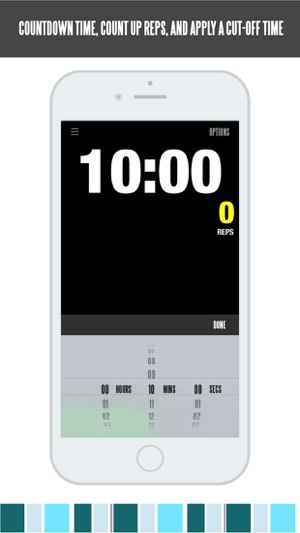 The only thing I had a hard time figuring out was (but not really worth removing one star) that I couldn't figure out the "reps" section of the tabata screen. It stays at zero and there doesn't seem to be a logical way to type in the amount...but...I figured out that during the rest part of tabata you can quickly tap on the reps to add how many you did. Just have to remember to do that during the rest right after because it doesn't seem like you can adjust that after the timer moves on to next set, nor later when you view your results. Note that I do not use the playlist function (yet, or maybe never) so can't comment on that at this time. 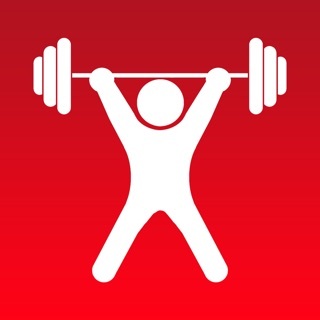 Must have App for WODs!!! Absolutely love this app. 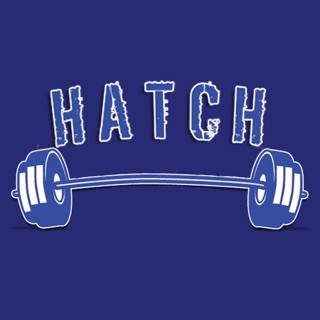 Is everything you need on timing WODs. Two things I really like about this app. The first being that it easy the red from any distance. The last is the customizability of the app. 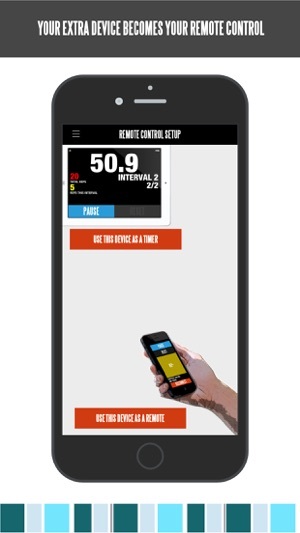 You can set it to time the Tabata workouts, intervals, standard, countdown, and nearly everything in between.